A few updates for you....it is finally time for some eggs to start hatching on our nests! I visited 20 nests today and five of them had some signs of hatching! The signs can be subtle at first, since we cannot actually see the chicks from the ground until they are ten days or two weeks old! The adults may be restless, males may stick closer to the nest, they wiggle, rock, look down into the nest cup. Suddenly those incubating females become more interested in what is happening beneath them than what is going on around them. The clincher is when we observe feeding behavior. I pulled up to one nest today and immediately saw both adults, heads down in the nest....the male was feeding the female, who then fed the chicks. Even after all these years, I am still so moved so be able to view this first indication that a new life has begun. Some males are more involved than others and my heart melted watching this male today, so involved with feeding his mate and new offspring. I wished I could wait at all nests for a feeding, but with so many nests, I have to keep moving and rely on my 24 years of experience to know when the behaviors indicate that hatching has begun. Sadly, I discovered one nest that had failed for unknown reasons. Noone was incubating anymore and the male was perched a ways from the nest. No female seen. Sigh. I am happy to report that I did recieve the new eyepiece from Japan and it fits my scope and it works perfectly! Thanks to all who contributed via the Go Fund Me page so I could get this replacement eyepiece. The additional funds will go towards gas and placing new poles. We are discovering new nest attempts and I am keeping very, very busy checking them out and trying to read all the bands that I was unable to read without my dearly beloved scope! And of course, visiting all known nests to determine if hatching has occurred. I am feeling overwhelmed, having gotten so far behind as a result of the scope fiasco. We never have enough volunteers but the ones we have are working hard to gather the data on their nests....new monitors are learning about behaviors, the experienced ones are always so ready and willing to run out and check a nest for me if I can't get there. Deep thanks to them all. Happy Memorial Day to you all! On this stormy day I have been working on lists of projected hatch dates for all our nests.....oh it's a big job. 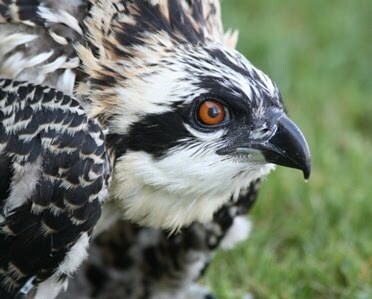 In my experience, here in Minnesota, Ospreys usually incubate about 39 days before the first egg hatches. I know other people, in other places, have come up with slightly different numbers. In the early days of this reintroduction, when I only had 8-10 nests to watch, I was able to check nests more frequently than I can now and we knew exactly when they began incubating and when the first signs of hatching occurred and it was most commonly on day 39. The first reintroduction in the US in Pennsylvania also came up with the same number. I do believe there can be some variation in those numbers but that is the number that I use for projecting hatch dates. The large number of nests we have now makes it impossible to get perfect dates for all nests so now I am categorizing them based upon the week that they should start hatching, rather than the day. It's a big list, but it will give me something to go on for organizing nest visits in the upcoming weeks. We still have a few nests that have not laid eggs...at least as of a few days ago. We have had Ospreys lay eggs at a shockingly late date....two years ago we had eggs laid in late May and chicks that didnt fledge until late August, and those birds and their dad stayed until early October! So we will keep checking! We often discover new nests this time of year, and it's true this year as well. Please do let us know about any new nests, and don't assume that we know about it! I would rather hear repeated reports of nests I already know about than to miss one I don't know about! Thanks to those who have shared new nests, new sightings with us....we really rely on the birding public to help us with this huge task of monitoring all known nests in the eight county metro area ( Hennepin, Carver, Wright, Anoka, Washington, Ramsey, Dakota and Scott counties.) Thanks! While the scope issues have taken a great deal of my time and attention, I have been checking nests and have a few updates for you. We have had two nests taken over by....geese. Whaaaaa! I have been looking for where those Ospreys may have moved, but have been unsuccessful in finding them nesting anywhere nearby. In one case the pair was unbanded so we may never know what happened to them. The other pair had one banded bird, which has not been seen anywhere, yet. At least one of those nests has already launched a brood of goslings and the nest is vacant again. People ask if the Ospreys will return now. I think it's unlikely. The timing is such that a breeding pair of Ospreys has probably found a new territory and been setting up there, or they may skip a season of breeding and remain "floaters" for a year. I also have to say in many other cases of a stolen nest, the Ospreys never did return. I have seen Great Horned Owls and Bald Eagles take over Osprey nests and the Ospreys have not returned to those sites. I know other places in the US have had more problems with geese than we have, even putting excluders on the nests until the Ospreys return. Perhaps this is a sign of things to come. We will see what happens next year at these sites. I also have been watching our oldest male, 23 years old, and was getting discouraged that each visit revealed no eggs, no incubation. His new mate is unbanded so I do not know her age. I was beginning to wonder if she was too young to breed. But alas, this week I saw that they were incubating! Woo hoo! This male was acting so protective, perched on the nest edge as the female incubated. Chasing away other Ospreys and a pair of eagles. He was also eager to incubate himself. In the past we have documented an increase in unhatched eggs from older males, which raises the question of whether fertility drops as these birds age. I will be watching as much as I can and have my fingers crossed that he will successfully fledge at least one chick. Last year his nest failed, as no eggs were laid. I am not sure why. He had a banded female as a mate for several years, and she was seen in the early season, then another banded female was present for a short time, and then the first female was present again. And yet I never saw signs of incubation, unless eggs were laid and destroyed between my visits. The second female was probably too young to breed (2 years old) and was resistant to copulation. This second banded female, now 3 years old, is on another nest this year. I have never seen his original banded female this year. I am glad he found a new mate and I am hoping for a happy outcome this year for this male, to set a new record for the oldest breeding male in our study! At any rate, he seems healthy and I thoroughly enjoy still watching him after all these years. We have a third egg at the Arb...laid sometime overnight....right on the predicted schedule of three days apart! And it was Mr Z3 incubating when I checked in! The big news is that the second egg was laid in the Arb nest in the wee hours of April 30! Right on schedule! We have been enjoying watching Mr Z3, who seems to relish the chance to incubate! My goodness this scope issue has been stressful. Nikon promised to call me a week ago and didn't. They did not reply to my email on Friday about what was up. Today they said, they would be sending a replacement scope.....but what they were offering was not a scope with the same capabilities, and they would not have that replacement scope in stock for a couple weeks. AHHHHHH. I requested they just send my scope and damaged eyepiece back. She said she would forward my request to see if they could do that. IF?????? I asked when she would know? She would not say. She said she would call me back when she knew. Then a few minutes ago I got a message from UPS saying a package was coming from Nikon, next day air, arriving tomorrow. Nikon couldn't be bothered calling or emailing me. Their customer service leaves a great deal to be desired. Anyway, I found a supposedly new eyepiece in Miami, on amazon....so I ordered it. Expedited shipping said it would be here by May 9. Fingers crossed that this is the correct eyepiece. And then, I received a generous check today from the Raptor Resource Project, a part of the money raised at the fundraiser I spoke at last February. Profound gratitude to John Howe and John Dingley for all their support. This will help me pay for the new eyepiece and begin moving forward again.